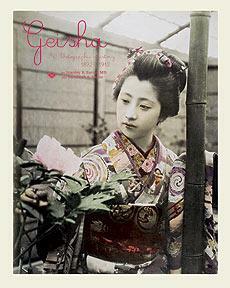 Geisha: A Photographic History, 1872–1912 is a beautiful hardcover coffee table book. I paged through this volume of history and beauty, and learned so much about the culture through this most amazing collection of photos and well-researched history that bullets important landmarks for the unknowing reader. The beauty and mystery behind images I'd seen before smiled knowingly at me through the pages of the solid tome. Written to share a wide array of photos from his collection, the "preeminent private specialty collection of 19th century historic photography," Dr. Stanley Burns maintains an incredible amount (over 800,000) of photos documenting medical history and procedure, as well as Japanese and Chinese culture. With photography opening up the East, Japan's documented history through these photos demonstrates an elegance and beauty existing nowhere else. Finding his niche, Burns reveals the reverent world of the geisha to readers gently. Although seeming super-feminine and utterly contrived, geisha represent an empowerment of arts. They stand for strength. Despite Western belief that these women continue an occupation representing prostitution, geisha do not act as prostitutes. Instead, their presence demonstrates a fine idea of the artful concepts in the world, as well as support for traditional Japanese arts and culture. Including an incredibly helpful glossary and historical chronology, this well-written text puts this collection in context and explains images for the reader's understanding of Japanese culture and its opening up to the west with settlement and ensuing tourism. This brilliant collection - made up of black and white, hand-painted and color photos - illustrates changes in the photography world and the evolving culture itself. Stated as the mission behind the book, the "art and life of 19th century geisha will be better understood and hand colored photos that document their existence will be appreciated by a larger audience" through this volume of words and images. Truly, Geisha: A Photographic History, 1872–1912 stands out exists as a wonderful photo collection elaborating on a specific historical beauty.